Whilst out yesterday picking up the remainder of the crack shelves in Lancaster, the G found me the shortpacked Iron Man Mark I figure I wanted. Now I read Iron Man in the early 80s, but like all Marvel Comics I lost interest by the late 80s and just find it hard to read any of them anymore. So honestly, when it was announced and Iron Man flick was in the works I was pretty much ho-hum about it. Though truthfully, I was more excited about this than certain recent Michael Bay films. I knew that this was likely going to be a good film from the moment the first stills leaked and voila... the original grey Iron Man suit was in it. I mean, they could have glossed over much of the character's history, including the evolution of the armor, and it would be standard sci-fi. But no... they actually adapted the Tony Stark story to modern times and have given us him creating the armor in stages. 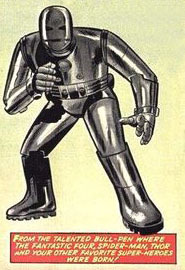 There was always something simple yet cool about Jack Kirby's original design which really only ever appeared in Iron Man's first appearance in 1963. And the fact they included this in the film just shows a love that I didn't expect. Now sure, this film could be a disaster like Daredevil, Elecktra, or Ghost Rider, but I'm thinking that it'll be several levels about those. And could Tony Stark have been better cast? I SAID I THINK NOT! Since I still care about Marvel (for reasons that escape me, except for the occasional bright spot like Ellis's Iron Man: Extremis, Ennis's Fury, or Brian K. Vaughan's Doctor Strange: The Oath) I'm probably twice as excited as you are. And only some of that is The Dude as Obadiah Stane. 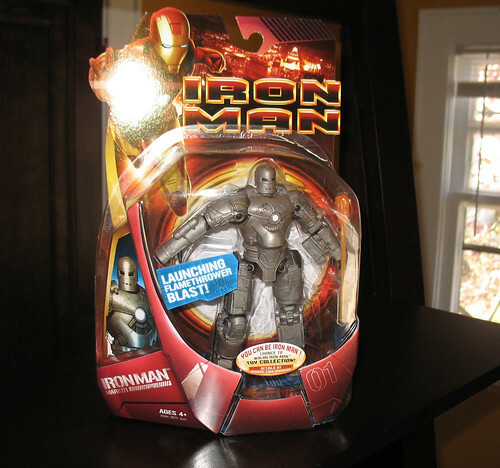 I'm really into the Mark 1 and Iron Monger figures. The Iron Man figures I've seen in Target are uninspiring, too stick-like for me. Re: classic Iron Man art, my favorite was always George Tuska. Remember when they added a nose to Iron Man's mask around the 70-issue mark? I lost sleep over that. It ruined everything. The Trailer looks really, really good. Can't wait for the flick! No. Is it meant to invoke the 1-time only black armor used in the the 1 issue in the 80s? I'd buy that figure purely because I was reading Iron Man back then. I've already got a baby sitter so I can go see it the day it opens. I've not been able to find the Mk I at all. I wasn't too crazy about the red and gold armor figure, but I bought one anyway. Glad I did because it's really nice. I'm pretty sure this movie is going to rock. The "Stealth" version is actually War Machine(although it is never referred to as such)! It comes with shoulder-mounted "gatling gun" and "missile launcher" along with clip-on wrist blasters. I wandered into a brand new shipment at the 'Mart at like 3 a.m. one day last week. As I also picked up Big Daddy, Grindcore and Jolt it was the only I.M. fig I snagged, but the others looked sweet also! Fine, go with the womanizing alcoholic dilettante who's seen fit to fake his own death on several occasions. He's obviously more ethical than the symbol of Freedom. (Always liked Tony more than Steve, but that was before the personality transplant.) My great disappointment with the Mark III figure is that he can't fold his hands to fire his repulsors properly like the ML versions. And maybe it's his Herc miniseries, or Doomquest, but I have to give it up for Bob Layton. Also, apparently the nose was added for a while to make him look more like the recently released Mego. Frowny. Well, I guess its the Republican in me that made me pull for the authoritarian capitalist. Plus the womanizing and alcoholism, but that's just good times. Yeah, think I'm going to buy a second one and trim down the wrist armor so he can hold a proper "fire blast" pose. Also, found a Mk I today. Woo hoo! This page contains a single entry by Nala published on April 16, 2008 3:46 PM. This is inevitable here. was the previous entry in this blog. MUST HAVE EXTREMELY YELLOW ROBOT MUDFLAP!!! is the next entry in this blog.